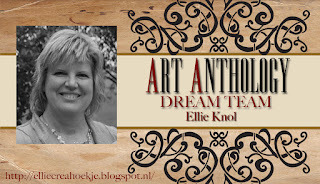 I, Ellie Knol, LOVE to play in an Art Journal … WHY? I can just play.. that’s why.. Using structure paste and the new stencil designed by Marleen van Meerendonk can only be a party.. it’s great all by itself. I am in LOVE with Kona Velvet paint… It adds so much depth! Such beautiful detail with these paints and stencil! ….for more pictures and step-by-step please have a look at the Snapguide tutorial I’ve created for you! Check out How to Play in Your Art Journal With Paints and Stencils by Art Anthology on Snapguide. Have a play and show it to us on our Facebook group Art Anthology’s Adventures in Art ! You can shop for everything used in this tutorial atArt Anthology’s online store. This entry was posted in Art Journal, collage, Colorations, Design Team, Ellie Knol, Mixed Media, Stencil, Velvet and tagged art anthology, Ellie Knol, Mixed Media Art, stencil, velvet on May 25, 2017 by DesignTeam. Hello! Phyllis here to share my latest Mixed Media Canvas! I wanted the canvas to have a soft look to it and I achieved that by spritzing Art Anthology’s Colorations and then spritzing with water to lighten the colors. I love Art Anthology’s Bubbles Stencil, you can tilt it sideways and it gives a whole new look! After I used texture paste and Art Anthology’s Bubbles stencil I sprinkled glitter on before heat drying it, it gives it a sparkle to the background! I gave the dragfly a couple sprays of Art Anthology’s Colorations and then a spritz or two of water, it gave me the look I was going for. If you ever doubt using new ink sprays just grab a piece of scrap paper and test it out! We have a bunch of Snapguide and YouTube Tutorials using Art Anthology products! Thank you so much for stopping by! I hope you are inspired to create something beautiful today! Be sure to stop by Art Anthology’s Facebook Group to share your project! This entry was posted in Canvas, Colorations, Design Team, Home Decor, Mixed Media, Phyllis Fernandez, Projects, Stencil and tagged 6x9 Stencils, art anthology, Bubbles, canvas, Colorations Spray, Design Team project, Mixed Media Art on February 1, 2017 by DesignTeam. Impasto is a technique used in painting, where paint is laid on an area of the surface very thickly, usually thick enough that the brush or painting-knife strokes are visible. Paint can also be mixed right on the canvas. When dry, impasto provides texture and the paint appears to be coming out of the canvas. Check out How to Paint a Palmetto Tree 2 by Kathy Adams by Art Anthology on Snapguide. Here are more detail shots of the canvas. Thank you for visiting the blog today. I’d love to see what you are making this summer. Did you know you can share your creations on Facebook a Art Anthology Adventures in Art? This entry was posted in Canvas, Mixed Media, Sorbet, Velvet and tagged art anthology, canvas, Impasto, Kathy Adams, Mixed Media Art, palmetto tree, sorbet, Super Heavy Gesso, velvet on July 25, 2016 by DesignTeam.